If you are a fan of the Inside Out cartoon that this game is for you. Answer the questions about your daily life and hobbies and see which of the characters of your favourite cartoon is similar to you. Can you guess it from the start? The games that are based on cartoons are always fun to play. Today we are going to pass a test which will tell us which of the Inside Out characters you are! All you have to do is answer the questions about you, your hobbies and your daily life. Get ready to see which character fits you most, but don't take it too close to your heart for it's just a game! 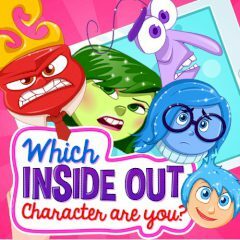 Games Similar Which Inside Out Character are You?